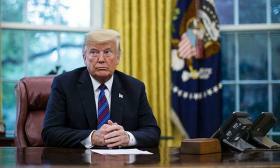 WASHINGTON -- President Donald Trump's scorched-earth tactics eventually led to a revised free trade agreement with Canada and Mexico, but at what cost? The outcome reinforced the president's view that bullying works. Now expect the White House to give the same treatment to Japan and the EU during bilateral trade talks. Trump, who feels every international agreement and policy that came before him is terrible, has predictably rebranded the new NAFTA deal. His MO is to declare a problem where none exists -- or it's minor -- and then claim victory when he has saved the country from the brink he pushed it to. That's how we got the U.S.-Mexico-Canada Agreement that Congress is now responsible for approving. The inconvenient truth is that most of what's in the trilateral trade agreement was already accomplished in the Trans-Pacific Partnership agreement with 11 other nations. But Trump withdrew the U.S. from the deal the minute he took office. TPP represented an attempt at NAFTA modernization, with the added benefit of binding nine other nations into a trade collaborative designed to pressure China into abandoning unfair trade practices. The major change in the USMCA was raising the bar on auto rules of origin. Whether the auto industry or U.S. workers will benefit is an open question. One thing is for sure, though: Production costs will rise. Some additions -- provisions on digital trade, labor rights, currency manipulation and customs -- are an advance over TPP. And the administration was able to wring modest concessions from Canada on dairy imports, although those minor gains are dwarfed by the harm to the dairy industry from Mexican retaliation to U.S. steel tariffs. But there was no reason to unnecessarily alienate close allies, create two years of investment uncertainty, stress the private sector in three countries and diminish U.S. credibility when many issues could have been respectfully, but forcefully, resolved through regular channels. Japan and the European Union are right to be worried about ongoing trade talks. They have a temporary reprieve from threatened auto tariffs of up to 25 per cent, but it could be rescinded the minute Trump senses that he isn't gaining the upper hand in talks. The Japanese are unnerved that Canada agreed to an import quota if national security tariffs are imposed on autos, because Canada fought for an unrestricted exemption based on its strong ties with the U.S. Plus, under global trade rules, countries are no longer supposed to introduce quotas on products, except for certain agricultural cases that were grandfathered. Commerce Secretary Wilbur Ross on Friday said Japan could ensure it avoids auto tariffs if auto companies produce more in the U.S., seemingly ignoring the extensive domestic presence of Toyota, Honda, Nissan and Subaru, and Mazda's plan to build a plant with Toyota in Alabama. U.S. trade officials have made it clear that they will be making one-way requests when it comes to autos. Don't expect any liberalization of the 2.5 per cent tariff on passenger vehicles or the 25 per cent duty on light trucks. It might be part of an effort to get Japan to open its agriculture market, because U.S. automakers have made it clear they aren't very interested in trying to penetrate Japan. Ford abandoned the market in 2016 and General Motors sold 1,389 vehicles there last year. Jeep was the top U.S. brand, with 10,102 vehicles. Japan eliminated auto tariffs four decades ago, but the Detroit 3 have basically concluded it's not worth the resources necessary to change consumer preferences in Japan. That said, even if automakers aren't going to make a big market push now, the U.S. can still ask for things that will make it easier at some point in the future: more acceptance of U.S. safety standards, changes to Japan's inspection system so it's less costly to get cars checked for compliance and making it easier to break into dealership networks. Those are things the U.S. tried to get in TPP, too. They are still worth pursuing, but treating trade partners with respect in the process makes everyone a winner in the end.